Didn’t I just write this column? Who’s stealing my days and hours? I’m up against some real time constraints here, so I think I’ll have to basically go pictorial this time. 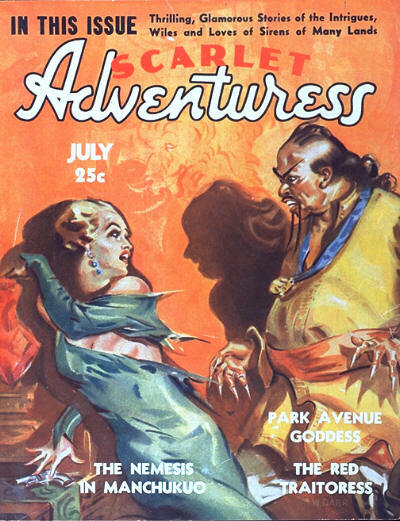 When I was noodling around the intertubes last week, I discovered this magazine called THE SCARLET ADVENTURESS, which I had never heard of before and know nothing about except the fact that they have some nice covers. 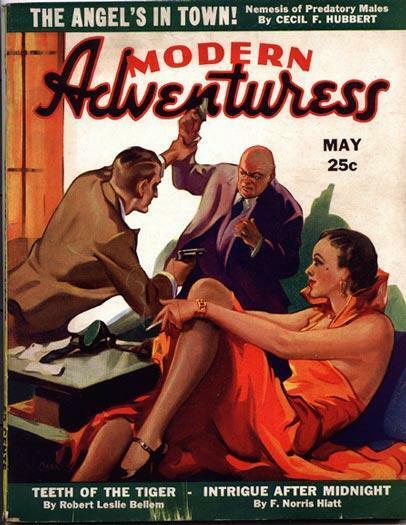 First of 16 none issues (7-35), though the reference site says “more may exist.” Apparently not a well-known title. Second issue (10-35). So far none of the authors’ names on the cover are familiar. I may be so bold to guess that some sound kind of pseudonomousy. Although by now (1-36) it seems as if they have their own stable of writers, or perhaps just use house names. Name change! (3-37). Also looks like they’re now going for a more modern setting and style. And finally, a familiar name on the cover (Robert Leslie Bellem).